California’s Route 1 between Carmel and San Simeon is an impossibly gorgeous drive that’s typically congested by mobile homes and RVs moving at a snail’s pace. But this morning my timing is perfect, heading South on a Sunday just past 7am to find the road completely empty, with unseasonably warm weather. At the wheel of the new Mercedes-Benz CLA45 AMG with the windows down and its "Panorama" sunroof open, there couldn’t be a better way to start the day's journey. Piloting the new CLA45 along the pristine California coastline is apropos, given that protecting Mother Nature partly necessitated this car’s invention. Increasingly strict government mandates are forcing carmakers to deliver maximum fuel economy and minimum carbon dioxide emissions, yet drivers’ appetite for fast and powerful cars remains voracious. The CLA45 is born from this conundrum, and is powered by the most potent 4-Cylinder engine in the world that generates an astonishing 355 horsepower from just two turbocharged liters of displacement; this is a tempest from a teapot. The aim is to deliver the high performance expected of a Mercedes-AMG while keeping its offenses to the environment at a bare minimum, and price is a formative factor here as well. The compact CLA-Class offers the cheapest car in the Mercedes range, the $29,900 CLA250, as well as the cheapest car in the Mercedes AMG performance range, the $47,450 CLA45 AMG. This is AMG’s version of performance on a budget, offering AMG’s first ever 4-Cylinder engine which is worlds apart from its mainstay of massive, fire-breathing 8 and 12-Cylinder engines that aren’t so conscientious either with your wallet or the fuel pump (the CLA45 averaged a respectable 27mpg for this test). So is the CLA45 AMG a contender, or a pretender? A silk purse or a sow’s ear? Let’s start with the CLA45’s design, which apes the larger, more expensive Mercedes CLS63 (at $106,500) that the automaker rather loftily positions as its big brother. The CLA45 catches plenty of attention despite its diminutive size, and looked expensive in our test car’s understated Mountain Grey paint. Its stance on the road is planted and confident, with styling that’s better from some angles than others, but is successful and fresh overall. 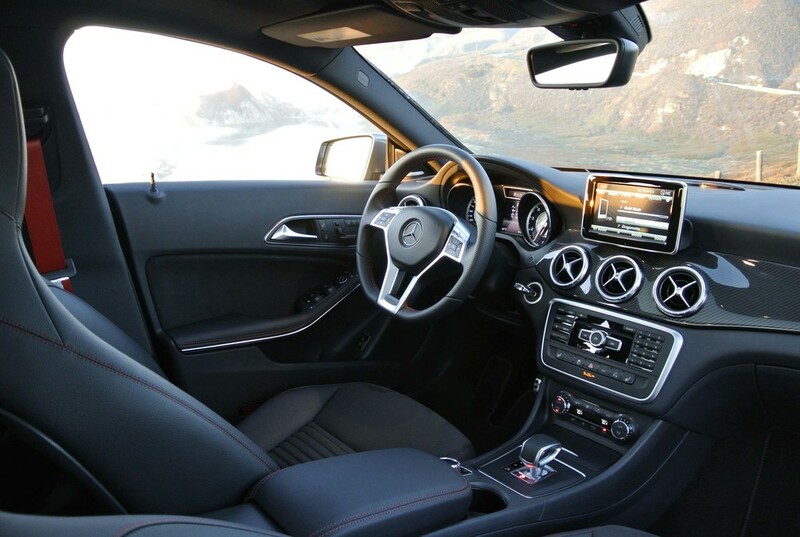 The interior, while compact, looks and feels high quality, with sporty red seatbelts and matching red stitching on the door panels, center armrest and seats, which have suede-like seating inserts flanked by – oh dear – synthetic (Mercedes euphemistically calls it “man made”) leather side bolsters. Genuine leather seating is available as an extra-cost option, but setting that detail aside, plus the somewhat flimsy air conditioning vents, little here reveals you’re aboard a Mercedes with economy on the brain. Space in the rear is adequate, with abbreviated legroom as expected from a car this size, and headroom suffers notably due to the CLA45’s raked roofline. Options on our test car included the “panorama” sunroof, premium sound system, and carbon fiber trim, all of which contribute to the experience (as well as the $57,165 as-tested price). On the road, while the CLA45 forgoes the thunderous (and fuel-guzzling) engine roar characteristic of its larger siblings, the lightening performance that defines the AMG driving experience is very much intact. Starting the engine offers no audible clues that it’s particularly special or powerful, but nailing the throttle is like drawing a slingshot or a bow, and propels the CLA45 with an elastically smooth alacrity. The acceleration is fabulous, reaching 60mph from a stop in just 4.5 seconds, with an electronically limited 155mph top speed. Unlike the CLA250, which makes do with front-wheel drive, the CLA45 is equipped with Mercedes’ 4Matic all wheel drive, which will send up to 50% of the power to the rear wheels when occasion demands; grip is very good indeed, as is handling overall, although the ride quality and road noise suffer a bit over less than ideal surfaces. With effortless power and taut handling, the CLA45’s forte is inhaling twisty roads with vigor and composure. The CLA45 is a very well built, fast and unique little machine that nicely balances performance with practicality. For now, it’s also without a direct competitor – that is until the arrival of the Audi S3 sedan later this year. Something Old is New, Again. ©2013 Beautiful Noise, LLC. All rights reserved.